Takayama’s Autumn Festival returns this week, bringing ornate centuries-old floats and an enchanting parade to the small Japanese town. Today marks the kick-off of the Autumn Festival in Takayama, a charming town located in Japan’s mountainous Gifu prefecture. With a history dating back over 350 years, the festival is one of two similar celebrations that take place in Takayama each year (the other is the Spring Festival, held April 14 and 15), each of which honours a different town shrine. The Autumn Festival, which runs from October 9-10, is also known as the Hachiman Festival, since it celebrates the deity of the Hachiman Shrine. In honour of the festival, around a dozen special floats called yatai are brought out from their storehouses. These impressive floats are several centuries old and feature intricate designs carved by Japanese craftsmen. Some also have life-like mechanical puppets that emerge from recesses at the top of the float and perform dances for spectators. The festival features loads of street food and a colourful procession of a portable shrine, said to contain the festival’s Shinto deity, around town; but the evening celebrations are the most magical part of the event, when heavy festival floats are pulled through the streets of Takayama’s beguiling old town. Glowing lanterns illuminate the parade and musicians play flutes and stringed instruments as the floats are dragged by participants dressed in traditional costumes. 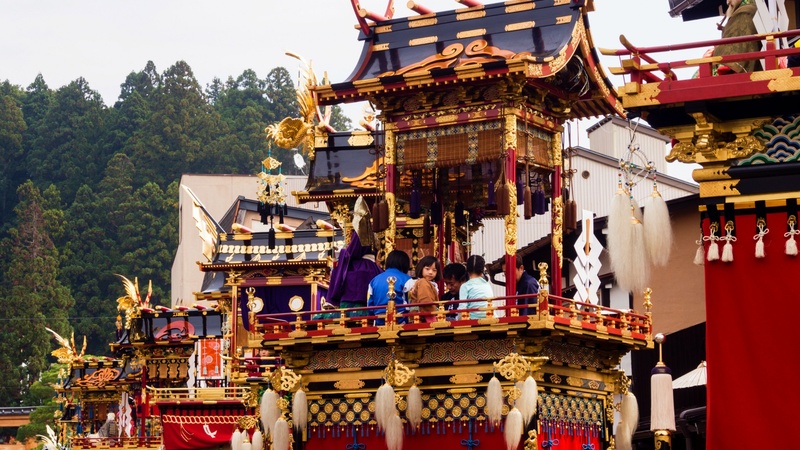 If you miss the festival, you can still still some of the beautifully-designed floats at Takayama Matsuri Yatai Kaikan museum, where they’re exhibited throughout the rest of the year.